Wake takes place over the course of 5 days as the body of an unknown soldier is removed from a grave in France and brought to London to be entombed with great ceremony. I did not realize as I began this book the importance of the anonymous body being disinterred in France and I wish I had a better grasp of that because I was a little confused at times in the beginning. Unlike Holly, I really enjoy books with multiple points of view so I liked the switching from anonymous scenes in France, to Hettie, to Evelyn and to Ada despite my early confusion. The book was slow to start, but once I just went with the anonymous scenes in France it was very emotional and flowed well from woman to woman. 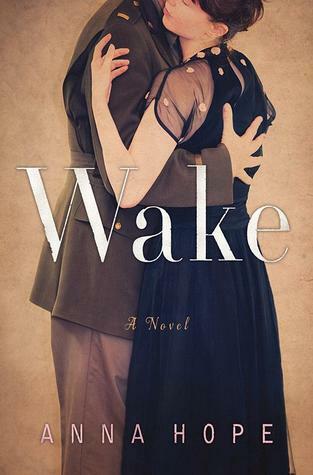 Once you read this definition– “Wake: 1) Emerge or cause to emerge from sleep 2) Ritual for the dead 3) Consequence or aftermath,” you see its the perfect title for the women of this novel. Ada is mourning her son, and yet hoping something caused her to receive the wrong news and that he didn’t die. Hettie is trying hardest to actually live, while giving her wages to her mother and trying not to resent her brother who was so affected by his war experience. And Evelyn is mourning her lost love and perhaps the most pitiable character as she is so full of anger and bitterness that she cannot move forward. This book was emotional and intense as the paths of these women brushed through each other and as they each came to terms with the body of the unknown soldier being presented in ceremony. Hope did an excellent job making these women feel real, not over dramatized at all as they changed over these 5 days. It was especially sobering to read knowing that WWII was coming in reality. I was thinking about this book for days after finishing it. Thank you Random House and Netgalley for the advanced read copy for review! The women meet for the first time just before their journey begins: Katie, an Irish maid from Dorchester, Massachusetts; Minnie, wife of an immigrant Russian Jewish chicken farmer; Bobbie, a wealthy Boston socialite; Wilhelmina, a former tennis star in precarious mental health; and Cora Blake, a single mother and librarian from coastal Maine. In Paris, Cora meets a journalist whose drug habit helps him hide from his own wartime fate-facial wounds so grievous he’s forced to wear a metal mask. This man will change Cora’s life in wholly unexpected ways. And when the women finally travel to Verdun to visit the battlegrounds where their sons fought as well as the cemeteries where they are buried, shocking events-a death, a scandal, a secret revealed-will guarantee that Cora’s life and those of her traveling companions will become inextricably intertwined. Only now will they be able to emerge from their grief and return home to their loved ones. This is a timeless story set against a footnote of history: little known but unforgettable. I thought this was a fantastic premise for a book. I was familiar with the concept of stars in the window for sons (and now daughters!) serving abroad and with the gold stars for those who lost a son during World Wars I and II, but I was not familiar with the government sponsored pilgrimages of these mothers to the graves of their sons. Its kind of amazing that our government did that-and really what an undertaking that must have been. (This short article is interesting for further reading.) I liked that the group we follow in the book, Party A, is made up of such very different women, the maid, the socialite, the Jewish farmer’s wife and the widowed Mrs. Blake. I believe that’s one of the good things about our military-all walks of life meet up together. Unfortunately, these soldiers died together, the mothers’ grief becomes a uniting factor across class, religion and race. 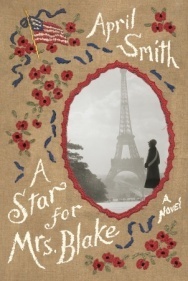 I think Smith got too carried away with her subjects and what could have been an interesting and touching story was too bogged down by extraneous details and side stories. If Smith had been able to narrow down her focus I think she could have also done more to keep her characters real and language true to the time period. It felt like every character you met had a back story, and they just didn’t matter. I would rather have gone deeper into a few issues, such as the separation of the white and African American mothers, than have read about the history of the Army General who planned the pilgrimages. The fact that there is a “death, a scandal, a secret revealed” on the journey should be enough to keep the reader engrossed without overloading on irrelevant information. There were passages in this book that I found quite moving, especially as the mothers visited the cemetery where their sons were buried and later the battlefield where they died. But the best parts of the writing I had to search for in between the trivial details or language that seemed to anachronistic to me. I was invested in Mrs. Blake’s story as well as Bobbie’s and Wilhelmina’s, and I wish I had been able to be more interested in the other mothers. This was definitely worth a read for the historical perspective and a different kind of women’s story. Goodreads is giving copies away right now if you’re interested. Scroll down on the Goodreads page to enter. I received this book for free from Knopf in exchange for an honest review. This does not affect my opinion of the book or the content of my review.